RCTC plans and implements transportation and transit improvements, assists local governments with money for local streets and roads, helps smooth the way for commuters and goods movement, and ensures that everyone in Riverside County has access to transportation. RCTC’s annual budget delivers more than $400 million in programs and projects across Riverside County. Transportation funding is comprised of local, state, and federal sources, as described in the sections below. In 1988, when voters approved Measure A, Riverside County’s first half-cent sales tax for transportation improvements, they set in motion a proactive response to growing congestion by spelling out a list of transportation projects to address the problem. 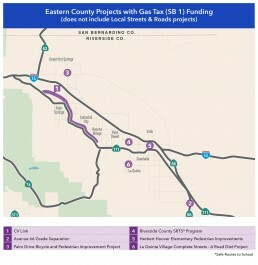 RCTC has ensured that the $1 billion raised by Measure A from 1989 to 2009 made a significant difference on virtually every major roadway in the County. Commuter rail, public transit, and commuters also received benefits. In 2002, Measure A was extended by Riverside County voters. Now, Measure A will continue to fund transportation improvements through 2039. Click here to see the expenditure plan and ordinance. RCTC receives regional arterial funds from the Western Riverside Council of Governments’ Transportation Uniform Mitigation Fee (TUMF) Program. TUMF regional arterial funds are used for roadway improvement projects and the Community Environmental Transportation Acceptability Process projects. To date, approximately $135 million has been programmed for TUMF regional arterial projects. In 2006, the Riverside County Transportation Commission (RCTC) began developing tolled express lane facilities to improve mobility. Express lanes provide solo drivers a choice to pay for reliable travel times and offer a travel option for carpools of three or more. In addition to the drivers’ travel benefits, the development of these express lane facilities provides RCTC with a significant, long term funding source (tolls) to pay for the development, construction, maintenance, and operations of these toll projects. The decision to become a tolling agency has and will continue to change RCTC by expanding our mobility mission for decades to come. The first project completed was the 91 Project. Led by RCTC, the project added regular lanes, tolled express lanes, auxiliary lanes, and direct express lane connectors from the northbound 15 to the westbound 91 and from the eastbound 91 to the southbound 15. Improvements to interchanges, ramps, and surface streets were also made along the 91 corridor. These improvements will reduce delays, allow faster emergency response, relieve local street congestion, and offer better access to public transit and trails. 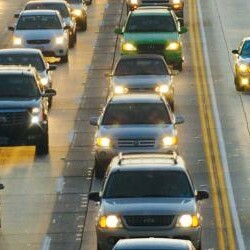 Additional information about the 91 Express Lanes is available at: www.91expresslanes.com. A second project is currently under construction to improve Interstate 15 in northern Riverside County. 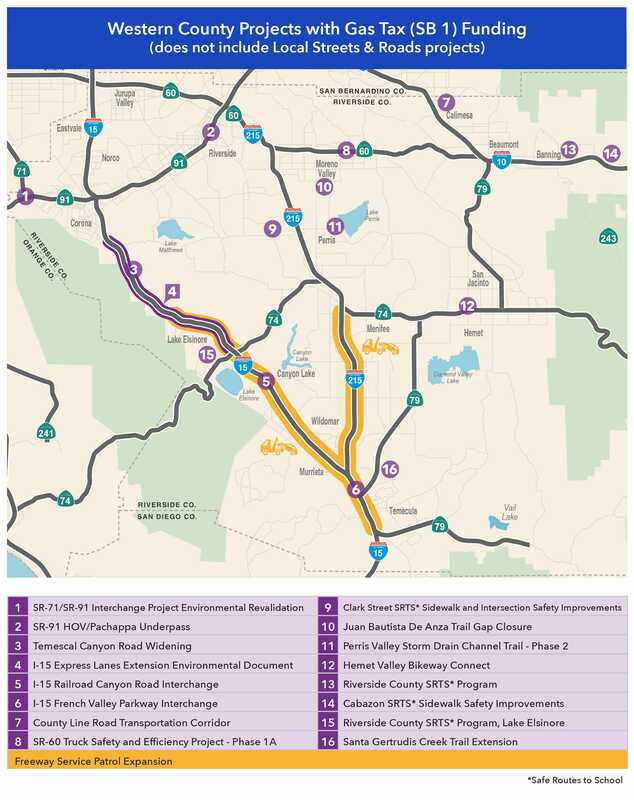 RCTC and its project partners, the California Department of Transportation and the Federal Highway Administration, are investing $471 million to improve Interstate 15. The project will add two express lanes to I-15 in both directions, from Cajalco Road to State Route 60, widen bridges and add soundwalls. This design-build project will be built within the existing median and offer multiple entry and exit points to the express lanes. The new I-15 express lanes are anticipated to open in 2020. When both projects are completed, RCTC will operate and maintain more than 70 lane-miles of tolled express lanes, manage customer accounts, and provide Freeway Service Patrol motorist assistance in the express lanes. Senate Bill 1 (SB 1), commonly referred to as the Gas Tax, is the Road Repair and Accountability Act of 2017, which was approved by California’s Legislature and Governor in April 2017. The Gas Tax generates funds for our transportation infrastructure through increased gasoline taxes and annual vehicle fees. It began providing funds to cities and counties in November 2017. In June 2018, California voters approved Proposition 69, which amended the State Constitution to prevent SB 1 funds from being diverted or borrowed for other purposes. 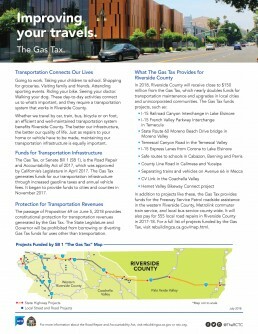 This page contains factual resources for the public to learn more about projects and services receiving Gas Tax funding in Riverside County. The information below is not exhaustive and provides highlights. 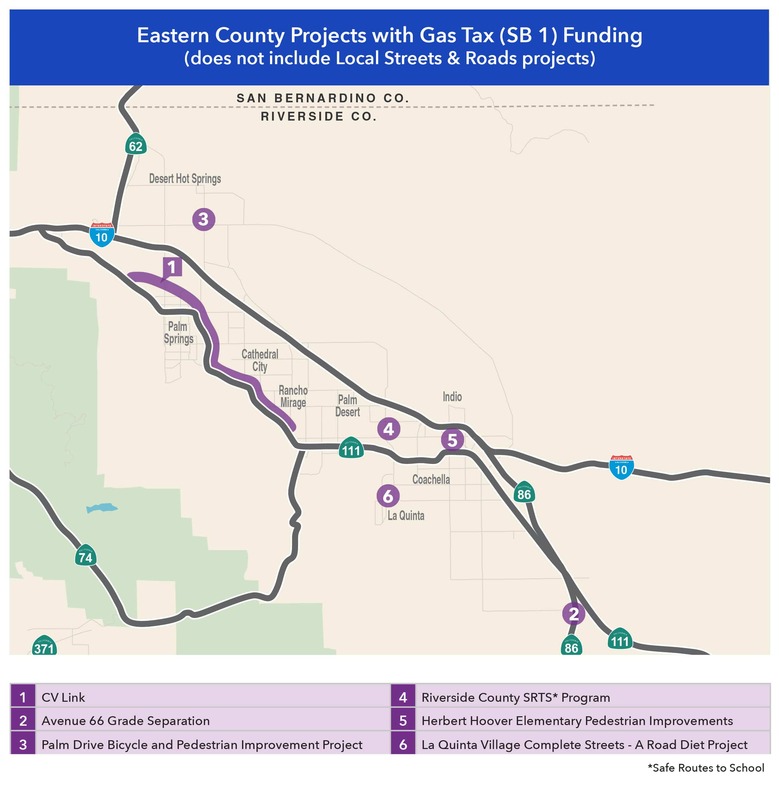 Residents may contact their local city or county government to learn more about the streets and roads being improved in their area with new Gas Tax (SB 1) funds. Detailed information about Senate Bill 1 (the Gas Tax) can be found by clicking here. The California Transportation Commission administers the State Transportation Improvement Program or STIP. The STIP consists of Regional Improvement Program (RIP) and Interregional Improvement Program (IIP) funds for projects that expand transportation capacity. As the regional transportation planning agency, RCTC selects projects proposed for RIP funds. 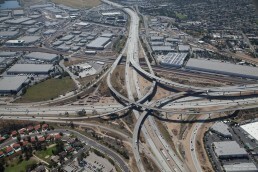 Caltrans selects IIP-funded projects. RCTC and Caltrans District 8 work closely in coordinating projects for these fund sources. The CTC approves the STIP during even-numbered years. The STIP serves as a five-year plan for future allocations. The Local Transportation Fund (LTF) is derived from a quarter-cent of the statewide general sales tax and is returned to the source from which it generated. The three areas of apportionment within Riverside County are the Western County, Coachella Valley, and Palo Verde Valley. LTF revenues received from the California Department of Tax and Fee Administration are allocated by RCTC for program administration, regional and local transportation planning, bicycle and pedestrian facilities projects, and transit services. LTF provides a dependable revenue stream for Riverside County public transportation operations. The State Transit Assistance fund (STA) is derived from the statewide sales tax on diesel fuel. STA is allocated by the state to Riverside County based on population and as a percentage of transit fare revenue. STA revenues received from the State Controller are allocated by RCTC for capital projects related to Riverside County’s public transit operators. In addition, each year, 2% of the Local Transportation Fund (LTF) revenue is made available for bicycle and pedestrian facility projects under TDA Article 3, also known as SB 821. Eligible projects include sidewalks, access ramps, bicycle facilities, and bicycle plan development. A Call for Projects is issued biennially in February, and funds are allocated each June. An evaluation committee typically reviews and ranks the projects based on evaluation criteria approved by the Commission. The evaluation committee, composed of the Technical Advisory Committee, makes recommendations for projects and funding award amounts to the Commission for their final approval. In February 2017, RCTC awarded more than $3.4 million to pedestrian and bicycle projects in Riverside County. RCTC will release its next call for projects in February 2019 for an estimated $3.5 million in available funding. Beginning in May 2018, funding for the program will be more than $440 million. Funding is distributed in three components: statewide (50%), large Metropolitan Planning Organization (MPO) (40%), and rural (10%). Applicants have the opportunity to be awarded at either the statewide level or the MPO level. At the MPO level, county transportation commissions, such as RCTC, are responsible for working with the Southern California Association of Governments to recommend projects for award. For more information about the Active Transportation Program, please click here. The Low Carbon Transit Operations Program (LCTOP) is funded from the Greenhouse Gas Reduction Fund. This program is aimed at providing operating and capital assistance for transit agencies to reduce greenhouse gas emissions and improve mobility with a priority to serve disadvantaged communities. The LCTOP funding in Riverside County is part of the state’s $34.6 million appropriation for FY 2016/17, as detailed in the state of California’s 2014 Budget Act. Caltrans, as the administering agency for LCTOP, prepares allocation shares to regional entities determined by formula, based on population and ratio of revenue of transit operator’s jurisdiction to the total operator revenues in the state. Eligible recipients include transportation planning agencies, county transportation commissions, and transit operators. RCTC receives funding from the Federal Highway Administration through the current federal transportation bill, Fixing America’s Surface Transportation Act (or “FAST Act”) that was signed in December 2015 by President Obama. The FAST Act authorized $305 billion over fiscal years 2016 through 2020 for the Federal Highway Administration (FHWA), Federal Transit Administration (FTA), Federal Motor Carrier Safety Administration, Pipeline and Hazardous Materials Administration, National Highway Traffic Safety Administration, and Federal Railroad Administration. FHWA provides two funding sources for which RCTC is responsible: the Surface Transportation Block Grant (STBG) Program and Congestion Mitigation and Air Quality (CMAQ) program. The Commission is responsible for allocating STBG and CMAQ funds to transportation projects in the County. The Commission selects and approves STBG and CMAQ funds through a call for projects. The Commission delegates the selection of projects for CMAQ funds apportioned to the Salton Sea Air Basin to CVAG. The STBG is intended to fund a wide range of transportation projects from capital improvements to planning activities. Projects previously approved for STBG funds include freeway interchanges, roadway widening, signal installations, road rehabilitations, and planning studies. CMAQ funds are targeted at transportation projects that benefit both congestion and air quality. Projects must undergo an air quality analysis demonstrating emissions reductions. In general, projects that add capacity are not eligible under this program. Projects previously approved for CMAQ funds include the purchase of transit vehicles, High Occupancy Vehicle (HOV) lanes, rail stations, and signal interconnects. The Transportation Infrastructure Finance and Innovation Act (TIFIA) program provides credit assistance for qualified projects of regional and national significance that provide critical improvements to the nation’s surface transportation program. 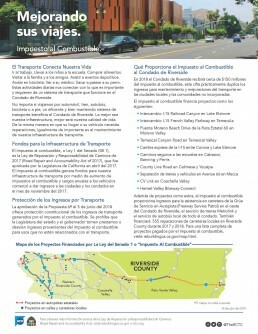 RCTC has received two secured TIFIA loans for the 91 Corridor Improvement Project and the I-15 Express Lanes Project. RCTC receives funding from the Federal Transit Administration through the current federal transportation bill, Fixing America’s Surface Transportation Act (or “FAST Act”) that was signed in December 2015 by President Obama. The FAST Act authorized $305 billion over fiscal years 2016 through 2020 for the Federal Highway Administration (FHWA), Federal Transit Administration (FTA), Federal Motor Carrier Safety Administration, Pipeline and Hazardous Materials Administration, National Highway Traffic Safety Administration, and Federal Railroad Administration. FTA provides funding to local public transit systems in Riverside County for buses and commuter rail. It also provides annual formula grants to transit agencies nationwide as well as discretionary funding in competitive processes. Below is a list of the primary funding sources used by Riverside Transit Agency, SunLine Transit, and RCTC’s Rail Program for Metrolink. Section 5307 is authorized each year via the federal transportation bill in urbanized areas with populations of 50,000 or more. Funds are distributed based upon population served and the amount of transit service provided. Under Moving Ahead for Progress in the 21st Century (MAP-21), the use of urbanized area (UZA) formula funds has been expanded to include the former Job Access and Reverse Commute program. In addition, only urbanized areas with populations below 200,000 were eligible to use the Section 5307 funds for operating. Under MAP-21 and the current FAST Act, transit systems with 100 or fewer buses in fixed-route service during peak service hours may now use up to 75 percent of their share of funding for operations. The new program also allows up to 85 percent federal share for Americans with Disabilities Act (ADA) compliant vehicles for paratransit service. The Section 5310 grant provides financial assistance to enhance mobility of seniors and persons with disabilities to serve their special needs beyond traditional public transit and ADA complementary paratransit. The program’s focus is funding mobility management activities and capital project expenses, primarily for nonprofit agencies; however, public agencies are eligible to apply for projects if the public agencies certify that no non-profit organizations are readily available to provide the services. Section 5310 funds can be used to cover both capital and operating expenses. RTA identified the use of Section 5310 funding to cover expenses for its ongoing travel training program. SunLine uses Section 5310 funds to partially fund its taxi voucher program. The Section 5311 transit funding provides funds to rural or non-urbanized areas in California. The program is administered by Caltrans, and the majority of these funds are passed through to counties based on population. Currently, RTA and SunLine have identified the use of Section 5311 formula funds for operations. Remaining funds are awarded in a statewide discretionary program for rural capital projects and intercity bus programs. The Section 5339 Bus and Bus Facilities program provides capital funding to replace, rehabilitate and purchase buses/vans and related equipment and to construct bus-related facilities. Funds can also be used to introduce new technology and safety and security items for transit systems. The program apportions funds to urban areas by population and service factors. This year’s program allocates about $764,000 million in formula funds for RTA and SunLine. RCTC has conducted a Strategic Assessment of Riverside County’s transportation needs today and for the future. This countywide strategic review began in May 2015 and was completed in January 2016. The process included extensive public input and technical analysis. More than 200 community members participated in RCTC’s Transportation Summits around Riverside County. At each Summit, residents shared their vision for our transportation future in a collaborative dialogue. The results of the public’s feedback were integrated with data regarding the county’s future growth and funding expected to be available. The Strategic Assessment is only the beginning of an effort by RCTC to engage the public and plan for the future of Riverside County. Please stay tuned as the Commission implements the recommendations of the Strategic Assessment. If you have questions regarding the Strategic Assessment and next steps, please contact RCTC at 951.787.7141 or info@rctc.org. Thank you for your participation and interest in Riverside County’s transportation future! This effort led to the development of RCTC’s first Long Range Transportation Plan; see below. RCTC is embarking on an exciting effort to develop the first countywide Long Range Transportation Plan (LRTP). The LRTP was kicked off in mid-2017 and will be completed in early 2019. It will provide a vision for what an integrated transportation system will look like in Riverside County in the next 20 years. The plan is taking a comprehensive review of projects on the state highway, regional arterials, rail and bus, freight network, and active transportation. It also will identify potential “bundles” of projects that can be developed in a systematic approach, demonstrate environmental benefits, and put RCTC and its member agencies in a more competitive position to score well under cost/benefit analyses when seeking funding for transportation improvements. This effort will also help RCTC better prioritize and coordinate the different planning efforts across the county with state, regional, and local agencies. RCTC is the agency charged with recommending projects proposed for funding under the Regional Transportation Plan/Sustainable Communities Strategy (RTP/SCS). The RTP/SCS identifies strategies to meet mobility of all modes, legislative, financial and air quality requirements in the six county area of Southern California and is overseen by the Southern California Association of Governments (SCAG). This plan is updated every four years, most recently in June 2016. RCTC’s role in the development of the RTP/SCS is to identify long range transportation improvement projects beyond those already programmed in the six-year federal funding plan. RCTC coordinates the input provided to SCAG with local agencies and transit operators in order to ensure consistency with city and county transportation plans and projects. Every county in California is required to develop a Congestion Management Program (CMP) that looks at the links between land use, transportation and air quality. In its role as Riverside County’s Congestion Management Agency, RCTC prepares and periodically updates the county’s CMP to meet federal Congestion Management Process guidelines. RCTC’s current CMP was adopted in December 2011, the CMP is currently under review and is planned to be incorporated in the Commission’s Long Range Transportation Plan (LRTP), which is anticipated to be completed by early 2019. RCTC began a study in spring 2017 to evaluate a logistics-related regional fee on new warehousing facilities. The study is the result of a settlement agreement between RCTC, the County of Riverside, the City of Moreno Valley, and Highland Fairview in response to litigation involving the World Logistics Center. Highland Fairview is the developer of the World Logistics Center, which is planned to encompass more than 40 million square feet of large-scale logistics operations in the eastern portion of Moreno Valley. A result of the study could be a new program that would, for example, set a fee on new distribution center warehouses to offset the cost of highway improvements caused by the growth in truck trips originating or ending in the county. A study update was provided to the Commission in June 2018. Yes, please sign me up for The Point! The impact of delays caused by freight trains traveling through Riverside County continues to be one of the area’s most pressing transportation concerns. Southern California is the goods movement gateway to the nation because of the area’s numerous advantages: deep-water marine ports, highly developed networks of highways and railways, an extensive concentration of warehousing and distribution facilities, and a local consumer market. Congested highways and rail corridors are a barrier to keeping goods moving and the economy growing. Currently, there are 66 freight trains that pass through Riverside County each day; that number is projected to increase to 137 by 2035. Long waits at unimproved rail crossings create quality of life issues: productivity decreases, drivers become frustrated, local commerce suffers, and disruptions to public safety and emergency responses occur. Although goods movement growth presents economic opportunities, it also highlights the need to improve freight infrastructure. Riverside County serves as a conduit from the Ports of Los Angeles and Long Beach to areas beyond the state, with more than 77 percent of the freight being pass-through cargo destined for areas beyond the county line. Approximately 65 percent of the pass-through freight travels by rail, and the remaining 35 percent travels by truck. This results in having a freight train at most rail crossings at least twice an hour. Slow freight trains create delays for vehicles at many of the at-grade railroad crossings throughout the county. RCTC has been proactive in reducing the effects of goods moving through the area by conducting grade separation priority studies and developing a funding strategy to secure funding for local jurisdictions in Riverside county. In 2006, RCTC conducted a comprehensive study to evaluate the 62 at-grade crossings along the Union Pacific Railroad and BNSF Railway in Riverside County and prioritized 20 crossings as top candidates for grade separation. Since then, more than $500 million in local, state and federal funding has been invested in constructing 14 railroad grade separations and closing two at-grade crossings. Additionally, two more grade separations are planned to be completed by 2023. RCTC’s most recent Grade Separation Priority Update Study in 2012 evaluated and prioritized the remaining 46 at-grade crossings. In 2017, a Companion Study to the 2012 study was completed to update information regarding improving each of the remaining 46 at-grade crossings. The study identified 11 grade crossings considered as high priorities for the local jurisdictions for the next 10 years. RCTC also is monitoring new state and federal funding opportunities, such as the SB1 Trade Corridors Enhancement Program, which includes state and federal freight funding. As these new funding opportunities arise, RCTC will continue to work closely with the local jurisdictions to develop funding strategies and provide funding assistance to support projects that are vital for economic growth and reduction of conflicts between rail and road traffic. Provide greater mobility, improved quality of life, operational excellence, and economic vitality in Riverside County. Please click below to view the 2019 Legislative Platform. RCTC also conducts other planning efforts, such as planning for the Coachella Valley-San Gorgonio Pass Rail Corridor Service. Work is under way to prepare a Program Environmental Impact Statement (EIS)/Program Environmental Impact Report (EIR) document for this proposed project to provide additional Amtrak intercity rail service between Los Angeles and the desert cities in the Coachella Valley. For information about this project, please visit Passenger Rail. RCTC, the Orange County Transportation Authority (OCTA), and Caltrans Districts 8 and 12 are responsible for coordinating improvements to State Route 91 in Riverside County and Orange County. Senate Bill 1316, adopted in 2008, required the creation of an advisory committee comprised of board members from RCTC and OCTA. SB 1316 also required annual updates of an implementation plan of SR-91 improvements for the Legislature. 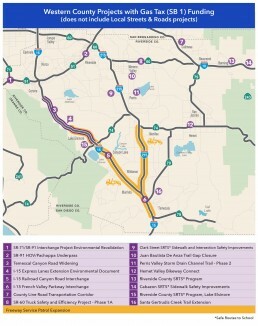 As spelled out in the legislation, the 2018 State Route 91 Implementation Plan was completed by OCTA and RCTC, in consultation with Caltrans, and outlines proposed projects, transit service charges, and completion schedules for transportation improvements to Metrolink, express bus, freeways and interchanges, express lanes, new east-west highway corridors, and high-speed rail. RCTC’s Road to Recovery plan was prepared after the Great Recession severely impacted Measure A and state and federal revenues for transportation. RCTC was forced to scale back and defer projects, due to lack of funding. RCTC recognizes that the deferred projects need to be built to address traffic congestion, but the agency is constrained by the funding that is available. In an ideal world, funding would be available to complete a full range of transportation projects, but reality forces RCTC’s Commissioners to make tough choices and prioritize transportation funding decisions. This document shows the thought process behind that prioritization process in 2010.